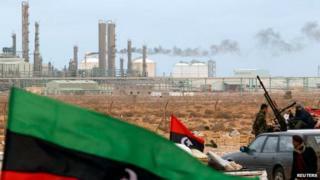 Rival Libyan troops have clashed over two of the country's main oil terminals for a second day, leading to their closure. The Ras Lanuf and Sidra terminals were closed on Saturday after pro-government forces clashed with rival militias who control most of western Libya. At least five people were killed in the fighting on Saturday. Libya has been plagued by instability and infighting since the toppling of Colonel Muammar Gaddafi in 2011. Forces allied to the Libya Dawn movement, which controls the capital Tripoli and most of western Libya, launched a surprise assault on the oil facilities on Saturday. The facilities are controlled by fighters loyal to the elected Libyan government, which currently sits in the eastern city of Tobruk. There are conflicting reports over whether the Libya Dawn fighters were able to gain control of the oil terminals. The facilities, which together account for more than half the country's oil output, were both shut down by the fighting. Libya's economy is almost completely reliant on oil exports, which have been heavily disrupted by the civil war and subsequent unrest. Falling global oil prices have also severely affected Libyan oil receipts. Military jets under the command of the Libyan government also bombed Libya Dawn forces near the border with Tunisia, killing several. Different groups now control most of the country including the two largest cities, Tripoli and Benghazi. Islamist-leaning militias, some of them remnants of forces which helped oust Gaddafi, have been fighting for power among themselves. Recent clashes forced the country's parliament to move to Tobruk. The groups that took control of the capital in August attempted to reinstate Libya's previous parliament and appoint a parallel government, but this has not been recognised internationally.